​Shanghai will become one of the Asia-Pacific region's strongest players in international arbitration as the city continues to host more international arbitration institutions and has a strong support from the courts, said the president of the International Bar Association (IBA). Thanks to the FTZ's further opening up policies inbound and outbound investment is thriving in the Shanghai free trade zone (FTZ), located in the city's Pudong New Area, Pudong Times reported on Oct 18. Companies in Lujiazui, Shanghai's financial hub, have benefited from the preferential policies of the city's free trade zone (FTZ), since the area was incorporated into the FTZ in April 2015. East China's business hub Shanghai will explore setting up community banks and international funds to encourage innovation and startups, said a senior city official Monday. 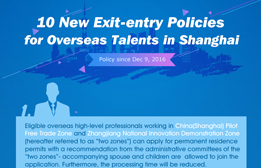 A trial program to test the issuance of a single, unified work permit for foreigners - replacing the current system under which two government entities have issuing authority - is expected to ease the burden of getting work in Shanghai for highly skilled expats, starting in October. ​When Ford Motor Company decided to move its Asia-Pacific headquarters from Singapore to east China's Shanghai, it was told that the company's president couldn't apply for his employment permit because he was over 60 years old.